Tags: futuristic, navy, strange, ugly, WOW, WTF? This thing is now floating…and sailing…and coming towards you to make your day better when it has left your field of vision again. And thanks to a tip from New River Valley Outdoorsman I now also know that the name of the first captain on it is “James A. Kirk”, which really amuses the nerd in me. Tags: carcarrier, surveyvessel, ugly, WTF? Just a quicky: saw this today on bitterendblog.com and had to share it with you out there. What were these people thinking?? 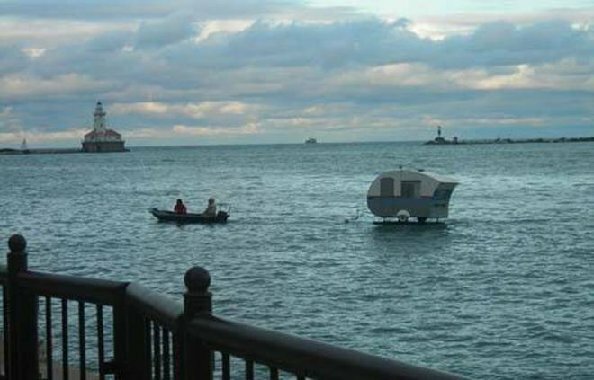 Well, whatever it is: I guess it beats this floating camper-van!